Time Travelers: Russell Boyd interviewed for World Gaming Executive magazine! 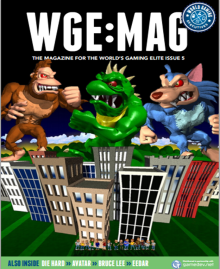 Russell Boyd interviewed for World Gaming Executive magazine! Turn right now to page 15, if you are reading this blog then you want to know more about the fabulous director who makes some of the most astounding machinima movies around. Pooky got the opportunity to interview Russell and explore his remarkable in depth knowledge of this intriguing medium. It is an interview well worth reading for its enlightening answers.